Arrive in the home of new movers each month inside a Welcome Package from the community. Perceived by the new mover as pure hospitality NOT advertising. Refreshingly different for the new mover (ask about our provided new mover feedback). Our package has been market-tested and proven to get opened and acted upon. Ask about the hidden psychological triggers that make this happen. A custom designed full-color postcard from you to the new mover mailed out to the respondents of your first mailing. This feature is included in the price, exclusively for our annual business sponsors. Here, local business owners are able to monitor details such as account status, recent account activity, and survey feedback and demographics. This feature allows local business owners to see just how many new movers have been welcomed each month, broken down by zip code. All emails, invoices, redemption lists and more are able to be viewed within the Intranet as well. Local business owners may also enable the Positive Postings™ feature for Facebook from here. Our comprehensive tracking system provides you with two options to track: 1) the Our Town TruTrak™ App, and 2) Track Pack Envelopes. Both methods allow you to track your return on investment, validate redemptions, control timing of the second mailing — the follow-up Thank You Postcard, gather detailed demographic data of new customers and analyze data to perfect supplemental marketing/ advertising campaigns. Available on Google Play and the iTunes App Store. Compatible with both Android and Apple smartphones and tablets. Click or scan appropriate QR code to the left to download — FREE of charge. Validate and scan redemptions at point of sale or at your leisure to track your response as you go. Upon scanning redemptions, TruTrak™ triggers your second mailing inviting new movers back into your business a second time. This is the recommended and most efficient method of tracking. Have a TruTrak™ question? Feel free to call us or send us an email! All Our Town America gift certificates are printed with our signature monetary look using thermosecurity ink. We can mail to your customer base or add to it with any demographic criteria you wish such as special occasions like birthdays & grand openings. The possibilities are endless! Why not reach out with an effective incentive campaign to prompt business? 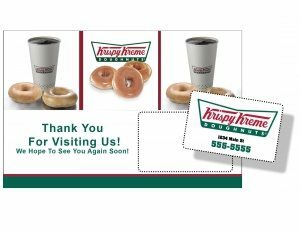 The perforated card can easily be removed or “punched out” of a postcard sized mailer by your customers. Ideal for: Frequent Buyer Cards, ID Cards, Event Calendars, Insurance Cards, Parking Passes & More! 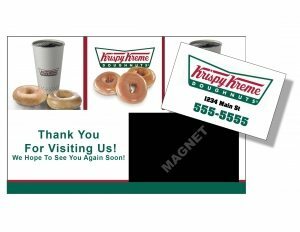 Magnets are no doubt the one product that keeps selling long after every other promo or flyer has been tossed away and forgotten. Keep your business in front of your customers every time they go to the fridge! Magnets are a proven, simple and cost-effective way to make your message stick, a must for any business that relies on phone calls! In this day and age everyone is talking about Social Media and how to stay on top of things. Let Our Town America do some of the work for you! As an Our Town America local business sponsor, you receive great feedback from new movers. Why not capitalize on that and increase your Facebook page traffic? Our free Positive Postings™ Program will post positive and monitored e-survey customer comments about your business directly on your Facebook wall! Don’t Forget, We Do the Hard Work For You! Exclusivity. We lock out your competition (same primary business). A Market-tested Package that gets opened, so your message is read! We build custom designed invitations for your business. Marketing Expertise. We know the critical elements necessary in making our program work for you. We have the names and addresses of families who have indicated a change of address. We print, insert and mail your invitation inside our package. Every month your business will receive valuable feedback on our new mover surveys. Pinpoint Tracking Technology: You’ll know EXACTLY how many respond and where they live. Download TruTrak™ on Google Play or the iTunes App Store. Thank You Postcard Program: A follow-up mailing to responding new families, moving you one step closer to their loyalty with you. Community Magnet Option: Like a mini billboard, your business can be on the refrigerators of these new potential customers.